Speaking of ginger — and with me, you pretty much always are — I’d like to share one of my favorite fall desserts and/or breakfasts: poached pears. A perfectly ripe pear is an autumnal joy all by itself, but when the pears are not quite ripe or are a little on the grainy side, poaching them erases all sins. Using a plain light syrup gives you a soft, unpretentious result reminiscent of the canned pears we probably all loved as kids, but adding grown-up flavorings to the liquid or using wine or juice instead of water elevates the simple fruit to heights of sophistication. Naturally, ginger is one of my favorite additions to the poaching syrup, but that’s just the start. Although I once thought nothing could supplant allspice in my “where have you been all my life?” affections, lately I can’t keep my hands off the jar of Szechuan peppercorns. These little pink gems look like miniature red popcorn kernels, smell like a cross between citrus and roses, and add just the right hint of delicious mystery. To play supporting alto to their trilling soprano, I add an equal amount of black peppercorns, rendering a subtly challenging syrup that makes both the pears and your tastebuds go “hmmm”. As a bonus, any syrup left after you’ve fished out the last of the pears can be mixed with fizzy water to yield a subtly spicy pear-and-ginger soda, or stirred into unsweetened iced tea for a flavor Snapple only wishes they’d thought up. In a large saucepan, combine the sugar, ginger, peppercorns and water. Bring to a boil, then reduce heat and simmer for 5 minutes. 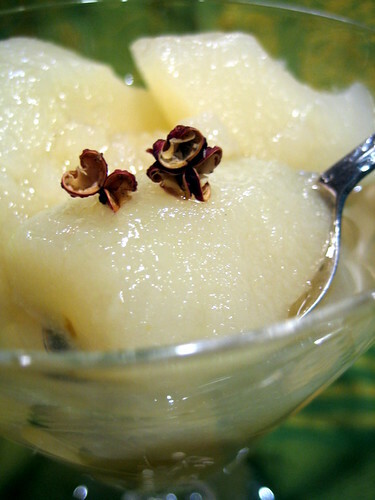 Meanwhile, peel the pears, cut in half, and remove the cores with a melon baller. If using full-sized pears, cut into eighths. Seckels can be left in halves. Tip the pears into the syrup, return to a simmer, and continue cooking until the tip of a sharp knife easily pierces the pears all the way through. 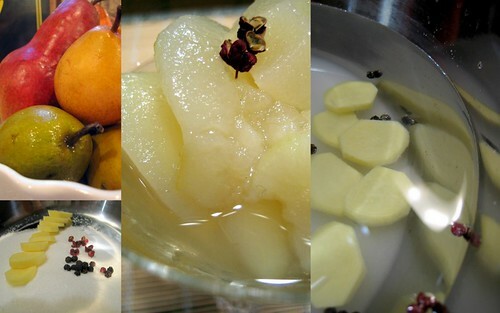 Let the pears cool to room temperature, then fish out the peppercorns and ginger. Cover and refrigerate until ready to serve in your prettiest bowls, with or without ice cream, for dessert, or with yogurt and granola for breakfast. Use any leftover syrup in your favorite beverage application. 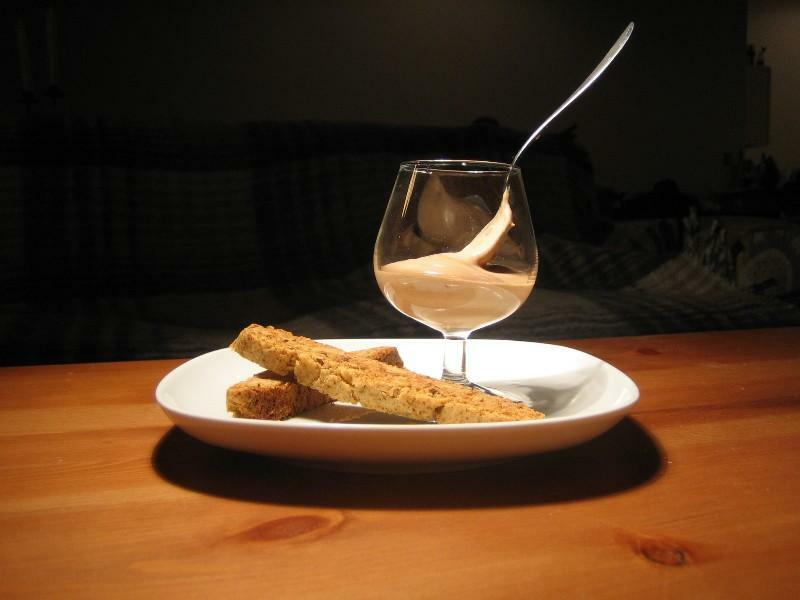 I am a fiend for the tiny, cute Seckel variety, which make for a particularly elegant presentation, but pretty much any variety will work. In this batch, I mixed Seckels and big red Bartletts with no ill effects. Very firm varieties like Boscs will hold together really well, although you will sacrifice some of the creaminess that makes a poached pear so soothing. You can bump up the quantity of ginger or black peppercorns to your heart’s content. Whatever you do, though, don’t add more Szechuan peppercorns unless you like your desserts with a side of Novocaine. The same compounds in Szechuan peppercorns that give them their addictively floral fragrance also make them a topical anaesthetic in larger quantities. Any more than I’ve indicated here will numb your tongue for hours. If you can’t get Szechuan peppercorns, you could get a similar, if less dramatic, effect with a couple of star anise or a cinnamon stick plus half a vanilla bean in addition to the black peppercorns.